You can build a form on your website and configure it so that messages arrive directly into Front. You can completely customize the look of your form using CSS. After creating a form, Front will give you a sample HTML source code. You should copy it and reuse it on your website. You can change the markup to suit your needs, but you should not modify the form attributes (action URL, enctype) or the name of the fields. Set the form location, which is the URL where your form will be hosted. As a security precaution, Front will only accept messages posted from this location. This can be changed later if needed. You can also configure success and error pages, where the user will be sent after completing the form. If you leave these fields blank, a query parameter will be passed to the location page (see below). Select who on your team has access to this inbox, and click Create inbox. After creating the form, you will see an HTML code section that you can expand. This will reveal the source code of the form that you can copy and use as a starting point to customize your form. inactive_form: the form has been deleted. bad_referer: the message was posted from an incorrect location. no_email: no valid "email" field was found. no_body: the body is empty or no body field was found. service_unavailable: the form service is currently unavailable and cannot receive messages. A message parameter will also be passed with a friendly error message in English. You can add multiple attachments to your form, which will appear in Front alongside the message. If you add additional fields (in addition to name, email, and body), Front will list them in the message as well. If your form contains a "subject" field, it will be used to define the subject of the message in Front. Otherwise, you can define a default subject in the settings. The subject will be used if you reply from Front. 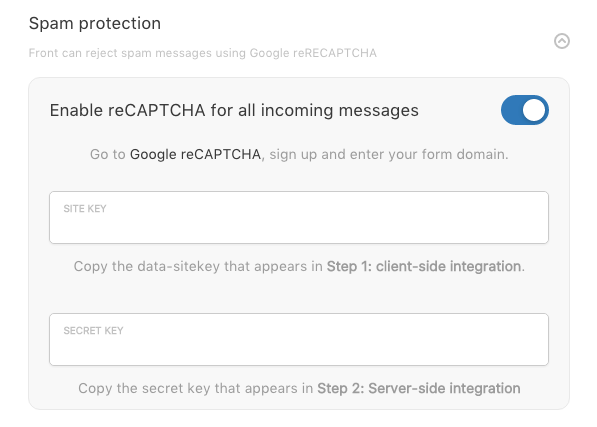 If you receive a high volume of spam messages on your form, you can enable reCAPTCHA. Go to the reCATPCHA landing page and click on "Sign Up". Expand "Step 1: client-side integration" and copy the data-sitekey value. Expand "Step 2: Server side integration" and copy the secret. Adjust the code of your form to include the captcha control. The HTML will update to include the reCAPTCHA controls. The value should be the public address of a shared email channel. You can also specify a sender name that will be used to reply. This is fantastic! And the timing couldn't be better as we were about to implement a simple form for new leads before sending them off to our more comprehensive Typeform brief. Question: the name field doesn't seem to pass their name to Front—should it? Scratch that, I can see it does pass the name… when I tested it with my own email address, it just showed my email because I must be a saved Contact already with not name. Works great! So simple. Well done. What if I already have an existing form (eg. via HubSpot), is there a way to connect this to that and have them both pull the data through? Ryan Bonnici not easily. However, if you are willing to use our API, you can always create a custom channel in Front and post messages submitted to HubSpot to Front ( http://dev.frontapp.com/#create-a-custom-channel ). I tried setting this form up on our site using ajax to submit the form but the redirects that the responses make cause errors. Is it possible to have this endpoint return simple JSON? Recreating this form in the API seems possible but much much more involved than just sending a request to the Form's URL, so if I can avoid that extra work I'd like to. Colin At the moment, our form inbox uses the PRG - https://en.wikipedia.org/wiki/Post/Redirect/Get - pattern. We will eventually open AJAX endpoints, but there are security aspects and we don't want to rush it. Hi Brooke, this requires a bit of HTML knowledge. Are you familiar with HTML? Regarding the preview, you will need to host the form somewhere on your end, so once you set it up, you should be able to preview it. This documentation should be pretty straightforward. It sounds like your questions are generally around HTML. We're willing to help with Front-specific questions, but I think your developers should be able to get started with this documentation. Is there a way to set the default reply email address for emails sent to form inbox? Our team deals with many products, each with their own email address. It looks like its defaulting to the team email address at the top of the list, which is not ideal. I've poked around the form inbox settings and didn't see any way to set it. Please see Step 4 for autoreply support. The default channel is specified with an HTML form tag: input type="hidden" name="autoreply-from" value="address@company.com"
You will want to change the address under value to be the desired sending channel for your users. Cori Morris Ahh thank you. I totally glossed over that tidbit. Setting the hidden field doesn't seem to be working for us. Looks like this works for auto replying flow, but our flow doesn't use autoreply. We manually reply to emails and the reply email is still set to the address at the top of the list. 1. can I add a phone number field to the form so that it automatically adds this phone number to the contact information? 2. I've set up a rule to automatically respond to the contact after they submit the form, but is it possible to hide the original form submission? 1. No, there's no way to update a contact in the Contact Manager via a form field. 2. Are you wanting to hide the original submission from your reply? If so, there's no way to do that at this time. This feature would be really helpful for my website (Travel agency). The only problem is that I need more than one form. As I have about 20 holiday packages that each require a form. Is this possible? Robert Jooste Yes! You can have as many form inboxes as you wish. do you have more info on forms like how to add tags, assigments and preset in general more data than just custom fields? Guillermo Dewey Absolutely! Please reach out to your Account Manager. They'll be able to provide any information you need. I noticed Gravity Forms (wordpress plugin) offers webhooks. Any chance it would be possible to set up a form through gravity forms using a webhook to get form entries into front? When creating a custom field, using numbers, can you stipulate the amount of characters needed?